Rita Lou (Maness) Troxell, 76, passed away suddenly at her home in Piedmont, Oklahoma on July 25, 2017. Rita was born on March 4, 1941 in Oklahoma City at St. Anthony hospital to Noble Edgar Maness and Marguerite Marie Hicks. She attended Southeast High School. She married Coy Bruce Troxell on June 18th 1957, in Midwest City, Oklahoma. All of her years, she was a devoted wife, mother, grandmother, great grandmother and a friend to all. They had three children, Anita Kaye Stephens, Coy Bruce Troxell Jr. and Craig Allan Troxell. She worked at Dollar General Store in Midwest City, and then was the Daycare Director at the First Baptist Church in Piedmont for several years. She also worked as a Nanny in her later years. Rita was very involved serving her church, teaching Sunday School, Vacation Bible School, Children’s Choir, and also sang in the Adult Choir. Rita was preceded in death by her parents, two brothers, Richard Allan Corwine, Steven Wayne Maness and one sister Carol Lee Proctor. She is survived by her husband of 60 years, Coy; three sisters, Vicki Anders, Neta Valentine and Sharon Kaye Gaede; one daughter, Anita and husband Mark Stephens of Tuttle, Bruce Troxell and wife Annette of Oklahoma City, and Craig Troxell, fiancé Carrie Spencer of Mustang. Grandchildren, Mindy Emerson and husband Blake, Jana Noble, Chance Stephens, Jordan Troxell and wife Whitney, Trent Troxell, Lexi Troxell, Hanah Troxell, Colton Troxell, Logan Troxell and Keller Troxell. Great grandchildren, Avery Castor, Hayli Castor, Ryder Noble, Grant Emerson, Stephen Emerson, Anna Emerson, Kinsler Troxell and Daklyn Troxell. She was also loved by many other nieces, nephews, cousins and other friends. To send flowers or a remembrance gift to the family of Rita Lou Troxell, please visit our Tribute Store. 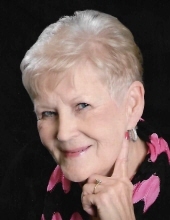 "Email Address" would like to share the life celebration of Rita Lou Troxell. Click on the "link" to go to share a favorite memory or leave a condolence message for the family.